Valentine’s Day is quickly approaching, so I wanted to share some of my favorite heart-shaped jewelry from deBebians. I chose all jewelry items that are affordable and equally versatile. Heart jewelry is timeless and will be able to be worn for any occasion that the recipient wishes. deBebians carries a huge collection of women’s signet rings. 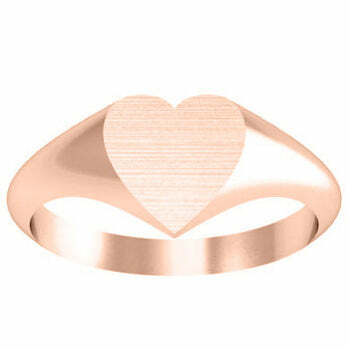 I chose this heart signet ring because it may be purchased in white, yellow, or rose gold and it has a solid back. This ring has a face that measures 9.4mm by 6.3 mm and may be engraved with a single initial or a monogram. We offer computer, laser, and hand engraving for an additional fee. 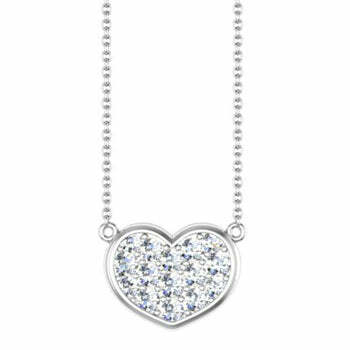 For a little extra sparkle, why not present your partner with this heart necklace with diamonds? The necklace will feature approximately 0.20 cttw of G-H color SI clarity diamonds. This necklace is available in 14 karat gold (white, yellow, or rose) or 18 karat gold (white, yellow, or rose). We have even more fine jewelry that is appropriate for any special occasion. Please contact a deBebians jewelry expert if you would like assistance in selecting an item or if you have any questions.